As part of the Global Urban Humanities Initiative Colloquium called Reading Cities, Sensing Cities we have asked students and visitors to write responses to each of the weekly guest lectures. Video of the conversation available here. Mathew presented on the role of music and sound in the emergence of modern civic sensibilities in Napoleonic Vienna, and how printed music came to shape a new politics of urban pedestrianism. In 1967, Guy Debord offered a radical critique on modern societies in his book The Society of Spectacle by arguing that the nature of society changes with the advent of mass media. Raymond Williams in his book Keywords (1985) describes “Spectacle” as a “Theory of Sight.” While much has been said about the role of sight in the making of a spectacle, Nicholas Mathew presents a new component of spectacles. He throws light on the role of sound in creating urban spectacles. In his presentation titled “Urban Space, Spectacle, Memory and Music in Nineteenth-Century Vienna,” Mathew discusses the relationship between music and social life, and the making of public spectacles in 19th century Vienna. 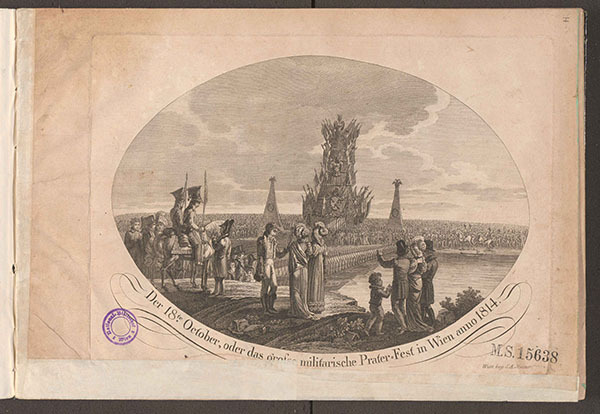 The images of the 1814 Vienna Prater Fest that Mathew showed are depictive of this, illustrating many people gathered to witness a musical performance. It was described as “a poetic and sublime scene beyond description.” “Spectacle” in the Oxford English Dictionary is defined as “a person or thing exhibited to, or set before, the public gaze as an object either (a) of curiosity or contempt, or (b) of marvel or admiration.” For the burgeoning middle class in the 19th century, a large concert by a famous musician like Beethoven was not only a marvel of music but also a sight to behold. Beethoven’s piece that Mathew played during the presentation, when first performed in Vienna, he explains, was as visually captivating as it was musical. The Victory Music was intended to re-create the imageries from a battlefield for all those who weren’t present. The orchestra, divided into two parts, marched onto the stage from two sides and met in the middle to perform this piece. Vienna is the capital and largest city of Austria. It has had a long-standing tradition of classical music, where several famous musicians like Mozart, Joseph Haydn, Beethoven, Franz Schubert, Johannes Brahms, Gustav Mahler, and Arnold Schoenberg lived and worked. Vienna houses some of the best opera houses, theatres, and concert spaces in the world. Viennese Balls are major tourist attractions, and have been a part of the city’s cultural legacy since the 19th century. These Balls are night-long events held in large concert halls or opera houses where up to nine live orchestras perform together. Music is often said to be a key part of Viennese culture and urban life. Mathew briefly discussed the role music plays as an instrument for political expression. In Napoleonic Vienna, musical compositions were often responsible for shaping new public experiences in urban spaces. The new musical compositions reflected changes in society and responded to them in various ways. 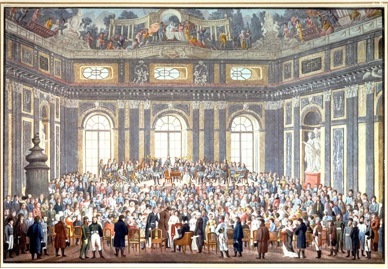 With the advent of a new class of bourgeoisie, the classical period in Vienna (late 18th century to early 19th century) was when public concerts were first held on a large scale, and became an important part of daily life in the city. Here music daily performs the miracle that is only otherwise attributed to Love: it makes people of all social stations equal. Members of the nobility and of the bourgeoisie, princes and their retainers, those in authority and those beneath them sit together at one music stand, the harmony of the music making them oblivious to the disharmony of their social standing. The act of walking is to the urban system what the speech act is to language. It is a process of appropriation of the topographical system on the part of the pedestrian (just as the speaker appropriates and takes on the language); it is a spatial acting-out of the place (just as the speech act is an acoustic acting-out of language). Here the city can be thought of as the metaphorical theatrical space of everyday life. Then, to quote Mathew, “public would be actors. They will be both spectators and performers in the city.” Lefebvre describes the experience of the “polyrhythms” of the city as “he who walks down the street is immersed in the multiplicity of noises, murmurs, rhythms.” Mathew’s presentation of the role of music in creating new civic sensibilities in 19th century Vienna can be understood as the historical backdrop for the impact that thousands of live concerts and public performances have on public life. Music, even today, has the potential to create an urban spectacle like no other. de Certeau, Michel. The Practice of Everyday Life. Translated by Steven Rendall. Berkeley and Los Angeles: University of California Press, 1984. Debord, Guy. The Society of the Spectacle. Translated by Donals Nicholson-Smith. New York: Zone Books, 1994. Swetha Vijayakumar is a PhD student studying the History of Architecture and Urbanism.